If you’re an office manager or decision maker, you might be in charge of choosing whether or not you need to hire a janitorial company to service your facility. Some immediate questions that pop into your mind are: “Is it worth it to hire an outside cleaning company? Would it be easier to clean my own office? Is it cost effective?” The questions and concerns seem endless. On a brighter note, using a cleaning company is actually a major asset to your business. The benefits outweigh any doubts and fears you may about hiring a professional office cleaning service. Office cleaners are essentially the creators of cleanliness, sanitation, and beautification of your work facility. A cleaner’s ultimate goal is to provide exceptional service as well as establishing good relationships with customers. A professional cleaning company cares for their customers’ needs and strives to meet all client expectations. Customers should be able to express any special cleaning requests they have. In contrast, if any concerns or complaints arise, they should be able to talk to the cleaning company immediately to resolve the problem. Being “on-call” is important because cleaning emergencies occur on occasion; even amid off-hours, late night, or weekends. During these moments of crisis, simply having the ability to make a quick service call to your cleaning company can save you a lot of stress. This service can be extremely useful for your company. Along with being a stress-reducer, a key benefit to hiring an outside cleaning service is it saves you time and money; two very valuable attributes of a company. Employees may need to take time off due to a dreadful cold or illness. Sick days are feared from both the employer and staff. The best way to avoid sick days is by maintaining a germ-free, sanitized, and disinfected work environment. Without having to clean your building yourself, you can focus more time and energy on your own work. A professional cleaning service will come in after-hours to perform nightly cleaning duties. This allows less distractions during your company’s work hours. In a field such as a health club, medical, industrial school, or public facilities, having a great reputation about being a “clean building” can attract business your way. Nobody wants to use a dirty restroom. Nor, be surrounded by dust, dirt, or grime. Filthy buildings can actually be a deterrence to your company. 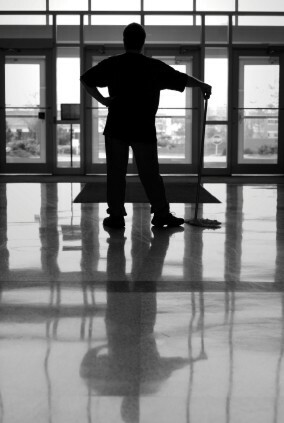 Prevent loss by allowing a professional janitorial staff to clean your facility on a nightly basis. A professional janitorial company follows customized specifications catered to your company’s cleaning needs. Cleaning supplies, tools, knowledge, and experience all play a role in sustaining a well-cared for and clean facility. Your employees, co-workers, and customers will appreciate working or spending time in a clean work space. This will generate more productivity within the office. Find out more information on how you can benefit from hiring Apple Corps’ professional office cleaning services by giving us a call at (781)-335-6900.